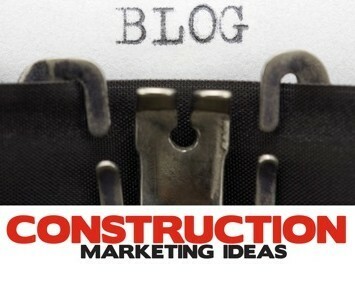 Te annual Construction Marketing Ideas Best Construction Blog competition is about to begin. 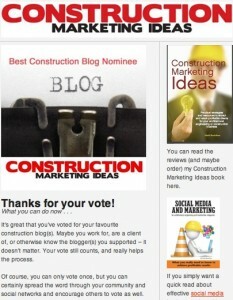 The competition, which has been an annual feature of this site since 2010, provides an opportunity for architectural, engineering and construction businesses to showcase their blogging achievements. I’ll write a positive review (with hyperlink blog references to your blog) for each qualified entry. Then, after nominations close on January 31, the popular voting begins. Success in your “get out the vote” campaign counts for half of the score — the other half is decided by a group of independent judges. This ensures the blog really has substantial quality, and your success isn’t just proof of your ability to encourage votes. and NOT be an obvious attempt to manipulate either social media or search engine results. This year, the competition will be enhanced with category winners. Reflecting the competition’s informal character, I’ll define the categories once the entries close (but early in the voting process). See the 2013 winners here.